This currency day trading method is one of Russ Horn's personal favorites. He calls it the Forex Power Pro which has been provided to the public as a goodwill gesture to show that Russ is the real deal, which he was selling his Rapid Results Method trading course. Brainyforex has now tested this strategy for three weeks with very bad results. As the trading strategy was very simple, a professional MT4 programmer programmed it into an automated trading system (EA) for brainyforex to test. The trading results can be viewed on this page here. Russ says that the currency trading strategy has a very high accuracy rate if a one-to-one risk reward ratio is used when trading it. He also says that it easily produces profits of $370-$520 (per trade!) in less than 15 minutes, with VERY LOW leverage. The chart below is the EUR/USD 1 hour time frame but Russ even uses the 1 minute time frame. Russ is giving away this premium currency day trading for who knows how long? The complete 30 page PDF manual can be downloaded for FREE with no strings attached from his website. 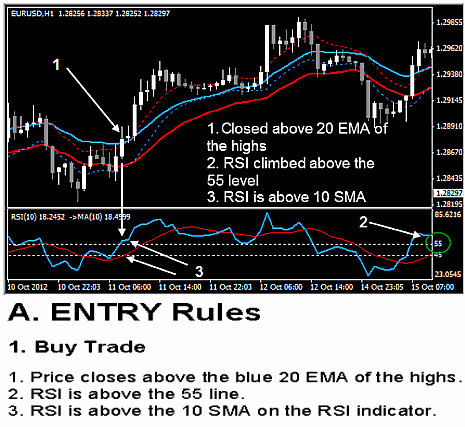 As at 28 November 2012, his site also contains videos and webinar showing how he trades this method. In the PDF you will also find information on where to set the initial stop loss and also how to adjust the trailing stop. It's all clearly set out, including explainations about how to setup the indicators shown on the chart above.